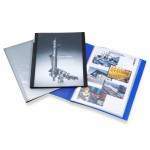 This hard wearing textured polypropylene 40 pocket display book in black is ideal for multiple applications. The 40 pockets allow 80 sides to be viewed. The front cover has a clear pocket for an A4 presentation sheet to personalise the book and add a professional look for business presentations and proposals. The clear top loading internal pockets are full height and are designed to ensure print will not lift off. Pack contains 1 book.